Located in the posh Bryant Park Hotel, Koi is not unknown to me, having discovered that place in another location few years ago for Restaurant Week. But the place in Bryant Park blew me away: beautiful, modern and with a lounge-y feel, it has a very cool atmosphere, without being scene-y. I started of by ordering a cocktail and settled with the Amber Gale, made with Bourbon, peach brandy, maple syrup and lime, a drink that was well balanced. Then, we went for a dish they are known for: the crispy rice sushi that they propose either with avocado, as a vegetarian option, spicy tuna or yellowtail tartare. We chose the latter. Very good, I love the texture the crispy rice gives to the dish. 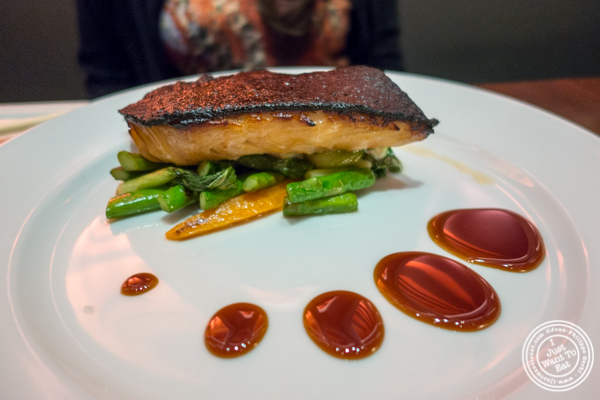 Jodi went for the Miso Bronzed Black Cod that was delicious, the fish being perfectly cooked, with a delightfully crispy skin. It was served with a medley of vegetables. On my side, I went for the roasted duck breast, made with apple brown butter sauce and roasted shishito peppers. The duck was delicious, perfectly cooked pink, with a delicious slightly crispy skin. I liked the dish but just wished they served it with some other vegetables, in addition to the very good shishito peppers. Last was dessert. I admit that they had a nice selection and it is where you wish they had a sampler. We hesitated between the five spice churros (does not sound that Japanese) and the milk chocolate banana spring rolls. We went for the latter that was superb: deliciously crispy, not too sweet, it was served with a chocolate ice cream and a banana anglaise that were very good. Overall, we had a great time at Koi. The food there is delicious: no wonder why this place was packed!